Adjustable Air Mesh w/ Chin Strap is really Cool! Sorry for the bad pun, but with UV ray sunblocking protection & great air flow and ventilation, it is ‘today’ and it is cool! Aqua-Terra Sandals by TEVA are proven performers for use in water, on land, or wherever adventure takes you. Bay Island Zip Pocket Shorts are great for the active traveler who lives for the outdoors - wear them swimming, snorkeling, diving, paddling, or scrambling. These great water shorts look just like regular shorts, they dry quickly, and travel well. Bug, Sun, & Lip Protection Kit is a great "Three in One" combination: a 4 oz. spray bottle of Ben's® 30 DEET Insect Repellent + a 3 oz tube of All Terrain "AquaSport" SPF 30 waterproof sunscreen with "Z-Cote" + a stick of All Terrain SPF 25 Lip Balm. Dry Summit Pack LT- A minimalist, waterproof alpine pack, the Dry Summit Pack LT weighs in at 11.3 ounces—with a carrying capacity of 25 liters. Polyurethane coated nylon and a rolltop closure keep your stuff dry. UPF Capilene QuickDry T by Patagonia Offers a 50 UPF sun protection rating, is very quick drying, offers expectional wicking, has a relaxed fit and split hem, and is highly breathable. 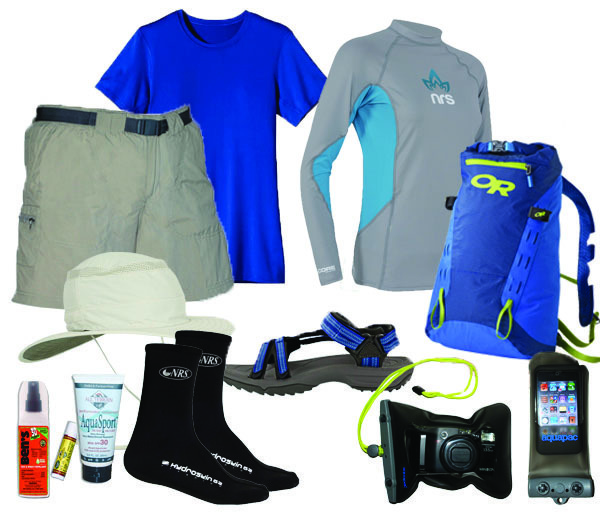 UPF Rash Guard & Snorkel Top is UPF 50 rated, lightweight, & the perfect versatile top for white water rafters & paddlers, snorkelers, surfers, and swimmers. Waterproof Mini Whanganui Case is perfect for today's small electronic gadgets. Take it to the beach or out on the water - the case is dustproof and submersible up to 15 ft. Use the phone normally right through the case and it floats safely if dropped in the water. HydroSkin® Wetsocks provide an extra layer of warmth while helping to protect your feet from blisters. Their plush lining and superior stretch offer unbeatable comfort. They're nicely compatible with TEVA sandals.